Now we always have lots of door prizes which adds to the fun. As you can see from the following picture, some are extra nice. The way we do things, a table is filled with prizes and each lucky person gets to chose the one they like best. The last Breakfast, Lady Luck smiled on me. My name was the first name drawn, so I had first choice. 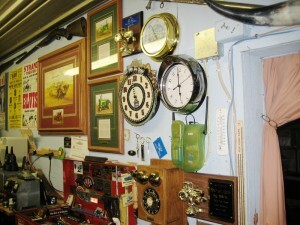 Check the picture below and note the headlight bezel clock on my shop wall. Sharp isn’t it, can you name the car it came from?